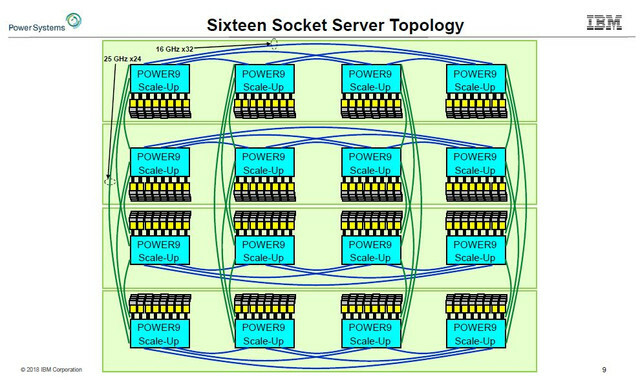 With the Power9 chip, there will be the Power9 SO (short for scale out) variant for machines aimed at servers with one or two sockets, due in the second half of 2017, and the Power9 SU (short forscale up) that will follow in 2018 for machines with four or more sockets and, we think, largely sold by IBM itself for its customers running its own AIX and IBM i operating systems. 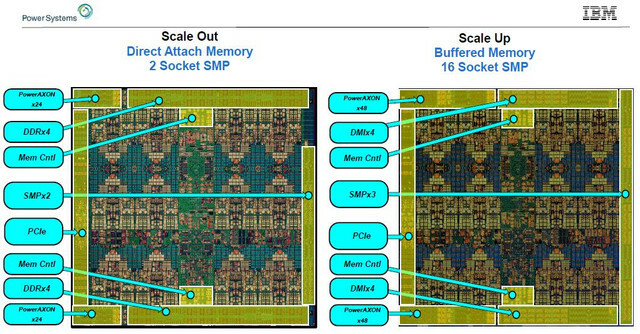 In addition to the different core counts and memory options, IBM is making the Power9 SO and Power9 SU chips available with two different levels of simultaneous multithreading, SMT4 with up to four virtual threads per core and SMT8 with up to eight virtual threads per core. and Thompto says that the Power9 pipeline was shorter from fetch to compute by five cycles compared to the Power8 core and had better branch prediction. The SMT4 core can do 64 instructions per cycle and the SMT8 core can do twice that at 128 instructions per cycle. The end result of all of the tweaks in the microarchitecture is a leaner and stronger core. 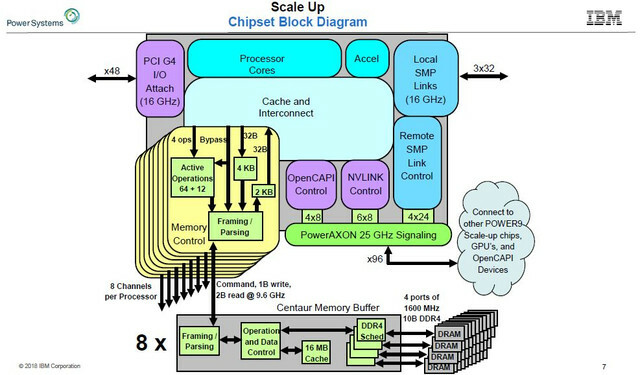 The Power9 chip is the first chip from IBM to support the Power 3.0 instruction set, which has a number of tweaks to it. First of all, the new ISA definition supports 128-bit quad-precision floating point math that is compliant with the IEEE 754 standard and, importantly, is useful for certain financial services and security applications that require higher precision floating point math. The new ISA also supports 128 bit decimal integer math, which is useful with databases and anything that is doing money math. IBM has also added a single-instruction random number generator, which is important for all kinds of simulations that require lots of randomness (it took more than one cycle to do this with the Power8 chips). 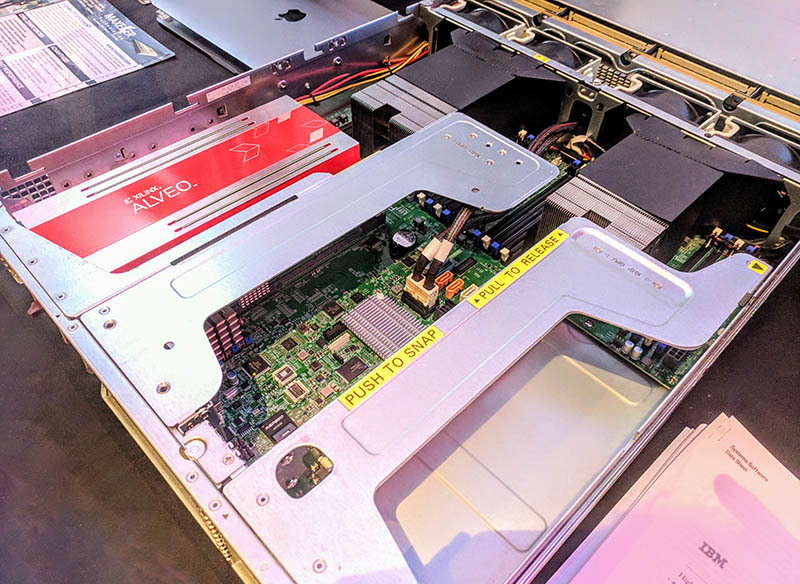 Zaius is a dual-socket platform based on the IBM POWER9 Scale Out CPU. 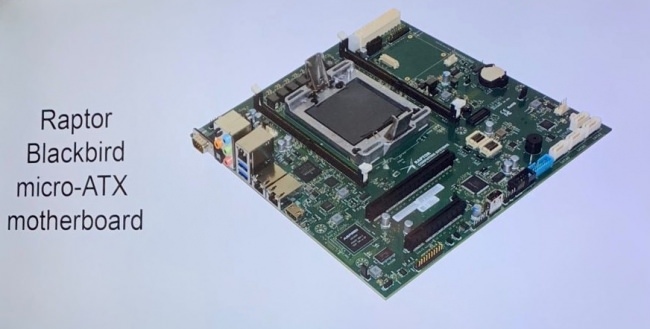 It supports a host of new technologies including DDR4 memory, PCIE Gen4 and the OpenCAPI interface. It’s designed with a highly efficient 48V-POL power system and will be compatible with the 48v Open Rack V2.0 standard. 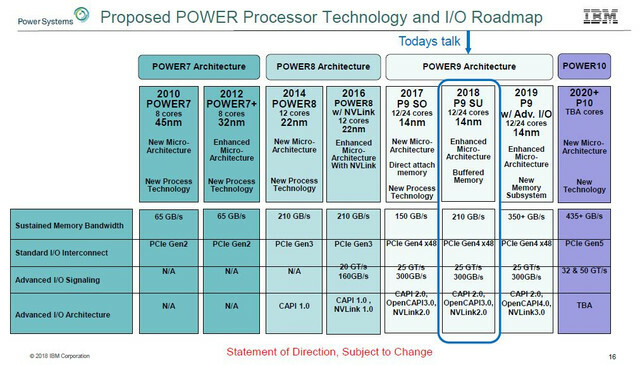 Acho que o Power9 está muito interessante, especialmente tudo o que está relacionado com I/O. Ele é uma besta a esse nível (Esquecendo o que existe no mercado de Mainframes). No entanto o suporte para 16 sockets, em si, não é "nada do outro mundo". A Intel, só suporta 8 sockets, com as suas soluções, no entanto third parties suportam mais que isso. Tens o HP Superdome X a suportar 16 sockets, o HP Superdome Flex e o Huawei KunLun a suportar 32 sockets. 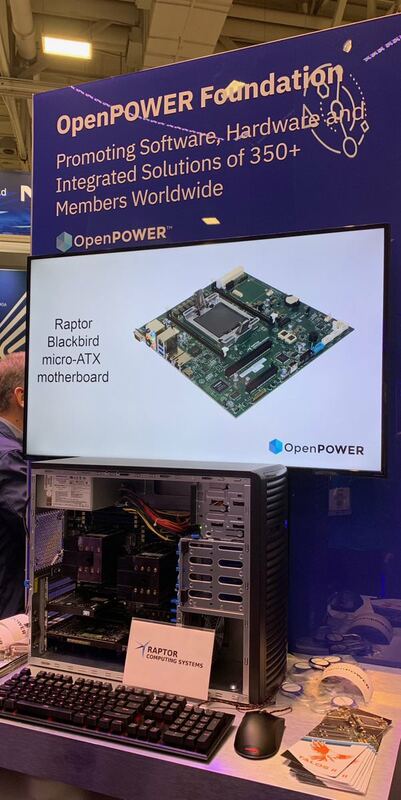 basicamente usam o mesmo layout dos sistemas da Intel Xeon e AMD EPYC, neste caso para uma board com Power9, e ao invés de um GPU da Nvidia ou AMD usam o FPGA da Xilinx. Trabalho com máquinas destas, e são grandes bestas, principalmente quando associadas a storages. A entrada de gama leva até 20 cores e 1 Tb de ram, mas as estrelas na minha opinião, são os modelos 922 com máximo de 24 cores e até 4Tb de RAM. Eu trabalho mais com os modelos virados para AIX / IBM i, mas a L922 dedicada para Linux é um monstro com um preço relativamente acessível. Os modelos Power9 também são muito competitivos (e com modelos específicos) para SAP HANA e Deep Learning / AI frameworks.